How to get ready for Plastic Free July! It's that time of year again: the Plastic Free July Challenge is upon us! Last year the 1 Million Women team, along with a whole group of lovely ladies from the 1MW community, took on the challenge in order to see how we could live without single-use plastics in our lives. If you're thinking of participating this year, be sure to let us know in the comments below! Plastic Free July (PFJ) aims to raise awareness of the amount of single-use disposable plastic items in our lives, and challenges us to do something about it. Our challenge, therefore, is to cut out all the single-use plastic in our lives during the month of July. 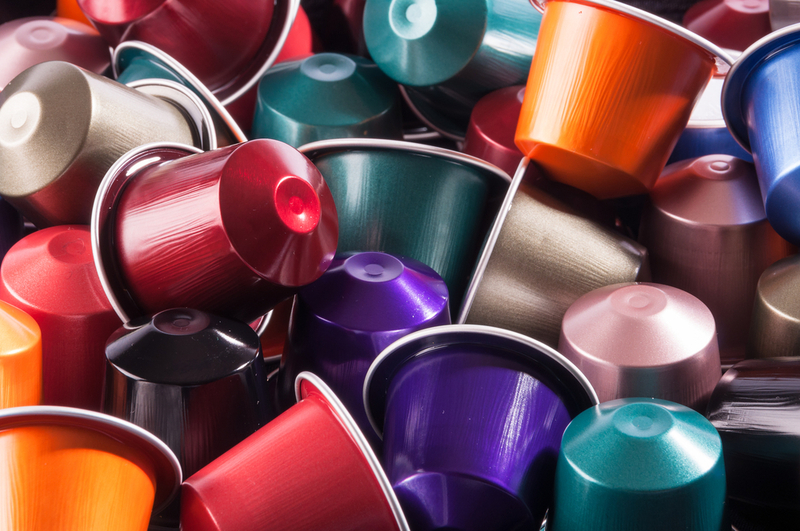 If you're not up to cutting out ALL single-use plastics, consider choosing an item to do without (such as plastic straws or takeaway coffee cups). Check out what a plastic-free day looks like in the video below! "Single-use plastic" is the term that we use to describe those disposable plastic items that you tend to use once and then throw away. Takeaway food containers such as sushi trays, Styrofoam boxes for hot food etc. Why you might not be able to rid your life of all of these just yet, start thinking about whether you could manage without just one or two of these. Buy your own 1 Million Women Keep Cup or canvas bag! So, what's the problem with single-use plastics? Plastic takes hundreds of years to break down, and along the way will degrade into smaller and smaller pieces called "microplastics", a material that has lately been working its way into the food chain. They're never actually disappear at all, meaning that ever single piece of plastic that's ever been made is still in existence! Even so-called "biodegradable" plastics require precise conditions to break down properly, and more often than not simply end up in landfill with everything else we throw away. As well as the toxins that these plastic fragments bring with them, a terrifying number of birds and marine life are dying from entanglement in marine debris and from plastic pieces clogging up their digestive systems, causing a slow death by starvation. 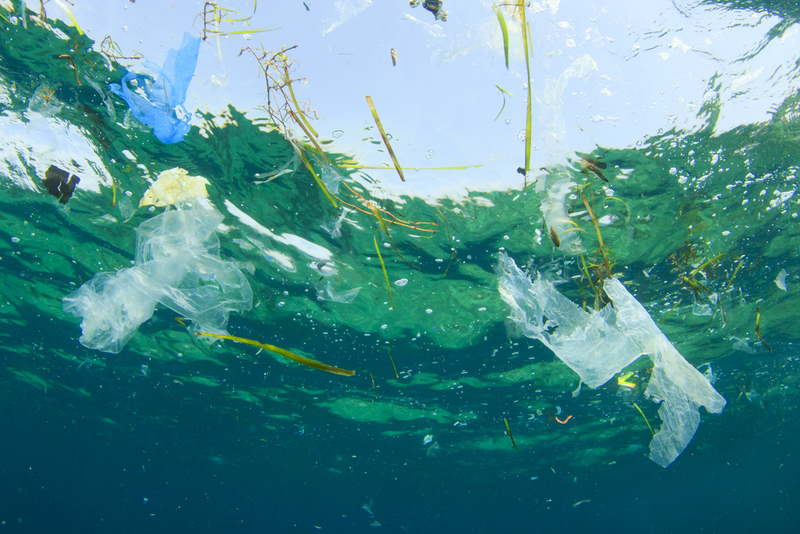 In fact, a 2014 study revealed there were 5 trillion pieces of plastic floating in Oceans around the world. The Washington post has done the maths - "With a global population of about 7.2 billion, that's nearly 700 pieces per person." So, do your bit by reducing this number a little during the month of July! 5 easy steps to quit plastic (from The Rogue Ginger) - Follow these five everyday simple choices and you will find quitting single use plastic seamless. 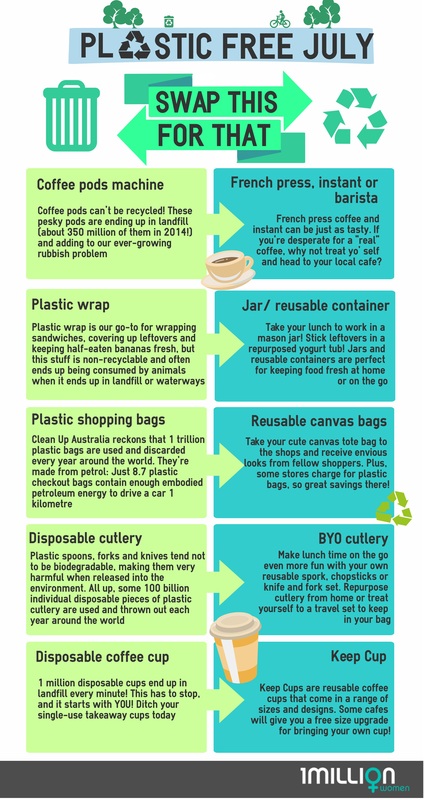 [Infographic] How to get plastic out of your life! - Helpful tips to finding environmentally friendly alternatives to the plastic that can sneak into your everyday life. 2 common questions about kicking the single-use plastic habit answered- But what about the plastic in...? Answering the common questions repeated often by those who may starting to kick the plastic habit. And be sure to use this handy chart as a reference for swapping single-use for reusable alternatives! 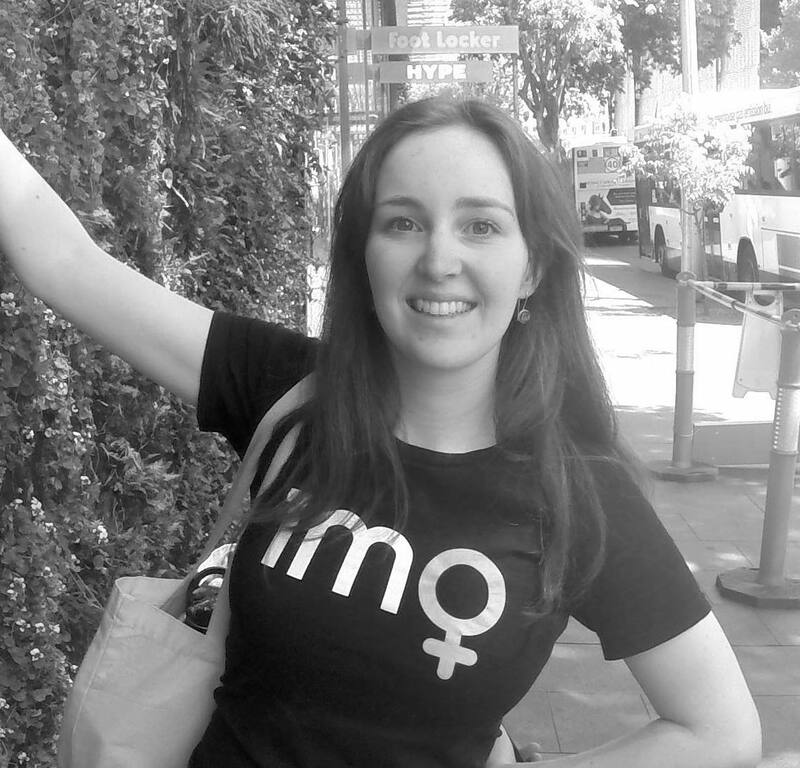 Melbourne's Erin Rhoads has lived two years plastic free! - Plastic-free living is totally possible, and Erin Rhoads (A.K.A The Rogue Ginger) has been doing it for two years. Read her story! Watch Lauren Singer Fit Two Years Of Trash In A Mason Jar - Remember our blog on NYU student Lauren Singer and her no waste life? She taught us all that a no-waste life is very possible! Rebecca Huntley - 'I tried living plastic-free for a week just to see if it was possible'- Going 'Plastic Free' has made me change ever so slightly and become more aware of the waste intrinsic in everyday life.